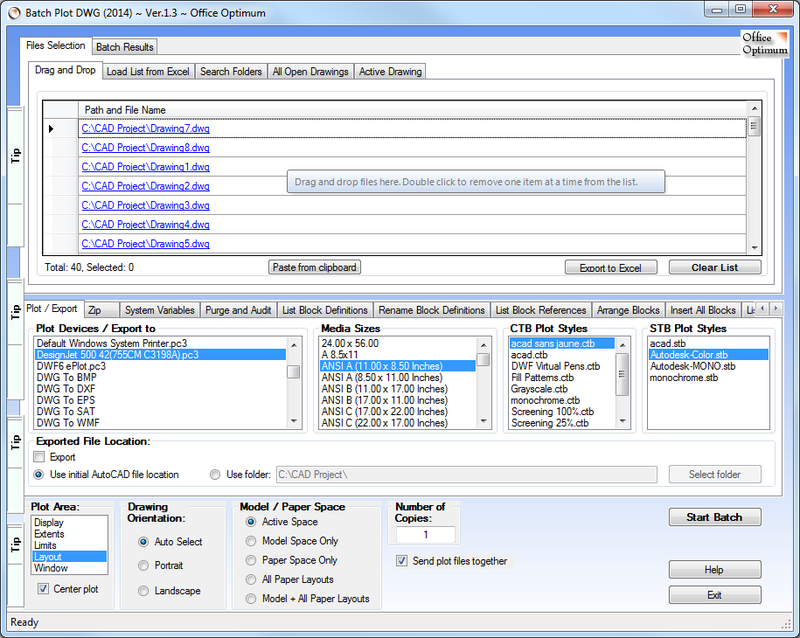 Office Optimum - Improve your work efficiency in AutoCAD. Tools to optimize your CAD and business office applications. We develop solutions to help you improve your work efficiency, reduce errors and frustration. The result of using our tools and utilities means increased speed and improved productivity in your office. Our solutions are designed to provide high utilization rates and superior ROI. Quick and easy plotting and printing batches of AutoCAD drawings; an indispensable application to every CAD manager and AutoCAD user. We invite you to harness the power of batching to eliminate a good part of the tedious work activities in the office. Special needs? Our software is adaptable, or, we can create something new, specifically designed for your needs. Just ask. SolidWorks is a registered trademark of SolidWorks Corporation. Other brand and product names are trademarks of their respective owners. © Copyright Office Optimum, All Rights Reserved.